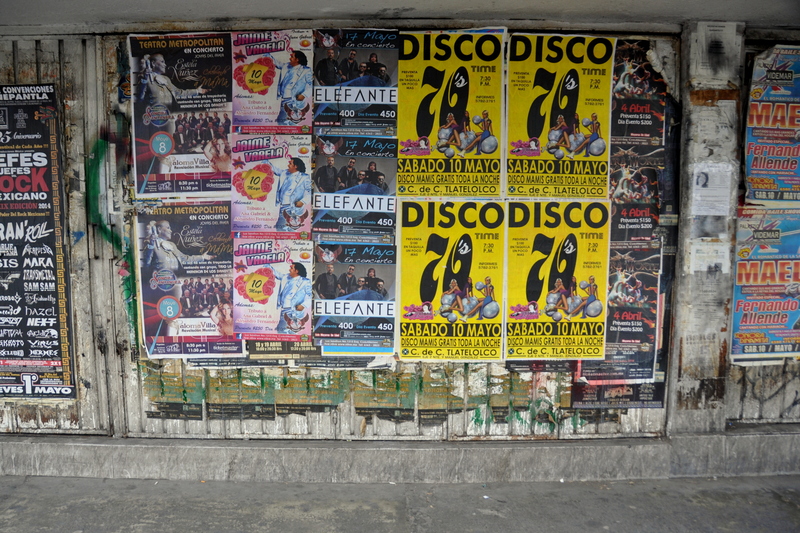 The Tlatelolco of today is a complicated urban expanse of high-rise apartment buildings, museums, green spaces, and pre-Colombian ruins, but its crime rate is somewhat alarming and the whole neighborhood has a reputation as a haven for drug addicts and thieves. The reality is more complicated, of course, but to understand today’s Tlatelolco we need to look at the barrio’s sad role in Mexican history. 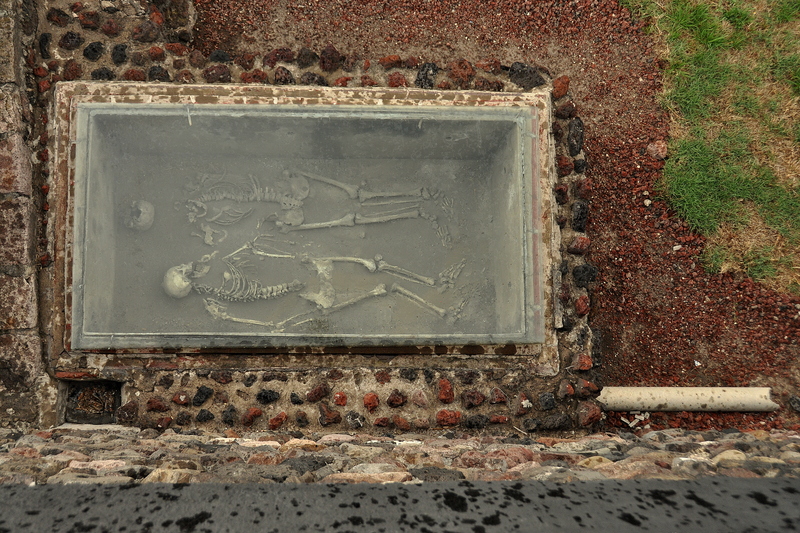 Tlatelolco was the site of perhaps the three saddest events in Mexico City’s 1,000 years of history. First, it was here that Cuauhtémoc, the last Aztec emperor, was captured – and ultimately hanged – by Spain’s Hernán Cortés, sometime in 1525. Cuauhtémoc’s surrender essentially sealed the fate of the independent Mexica (Aztec) people, most of who were forced into indentured servitude by their Spanish conquistadors. Alas, it is what it is, and most Mexicans today are mestizo – a mixture of Spanish and Native American ancestry. Those Aztecs, Mayans, Toltecs, etc. who didn’t marry into Spanish aristocracy became the predominantly dark-skinned, working-class Mexicans of today. Many of their descendants have since emigrated to the U.S. and elsewhere in search of a better life. The second event was the Tlatelolco massacre of October 2, 1968. Civil and labor rights protests were omnipresent during the turbulent sixties, from anti-Apartheid rallies in South Africa to Washington, DC and the “I have a dream” speech by Rev. Martin Luther King, Jr. Mexico City around this time was no exception. The country’s totalitarian government of then-president Gustavo Díaz wanted to preserve order in light of rising demonstrations against his administration’s suppression of labor unions. Following the military’s occupation of the UNAM (National Autonomous University of Mexico), thousands of young people gathered at Tlatelolco in peaceful protest, just days before the Summer Olympics (hosted by Mexico City). Their well-meaning – but perhaps naïve – attempt to turn the international spotlight away from the games and towards social injustice ended in tragedy after 5,000 soldiers and 200 tanks opened fire on the demonstrators. Remarkably, the incident was swept under the proverbial carpet and the games kicked off with little disturbance except for the infamous “Black Power salute” by medal-winning U.S. sprinters. 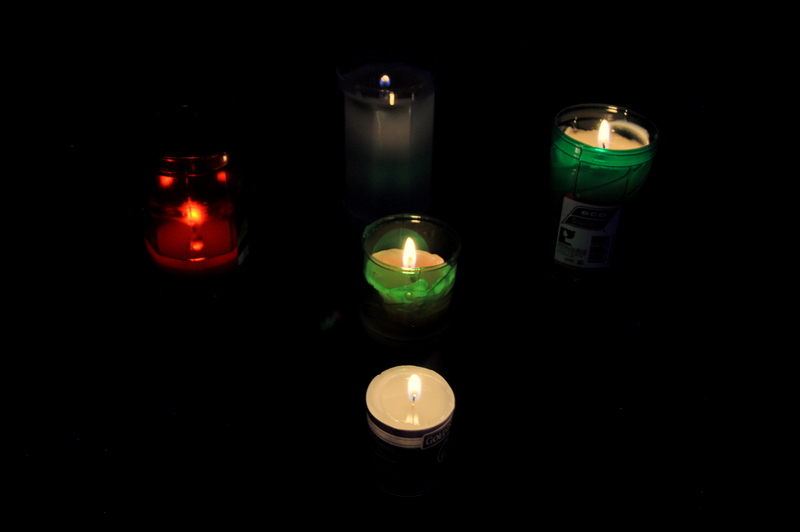 To this day, no one knows how exactly many demonstrators died. Some say thousands. 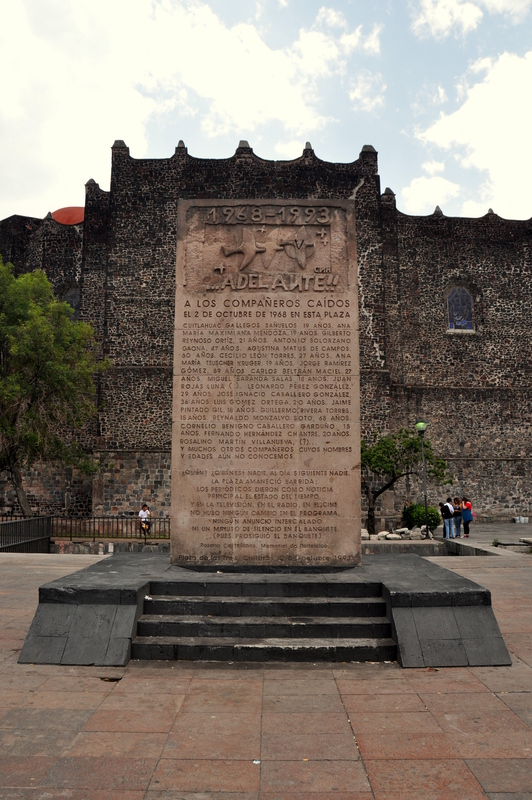 A memorial near Tlatelolco’s colonial parish church honors those who were killed in the massacre. The third – and arguably most unfortunate – tragedy to befall Tlatelolco was the 8.1-magnitude earthquake of September 19, 1985. Although the epicenter was off the Pacific coast over 200 miles away, Mexico City, with its soft lakebed soil, suffered extensive damage. 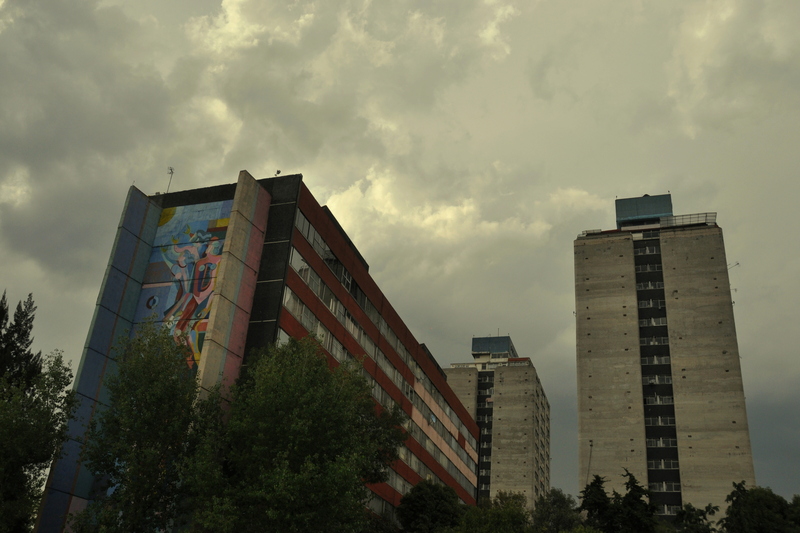 Tlatelco’s sprawling apartment complex, Conjunto Urbano Nonoalco Tlatelolco, received the brunt of the damage. Approximately 5,000 bodies were recovered following the earthquake, but – as with the massacre of ’68 – many place the exact numbers to be much higher. According to my research, at least two of the barrio’s 20+ high-rise apartments collapsed almost immediately after the quake, with several others eventually being demolished as well. Famed tenor Plácido Domingo, who grew up in Mexico City, returned to the city following the quake to coordinate rescue efforts for the barrio. 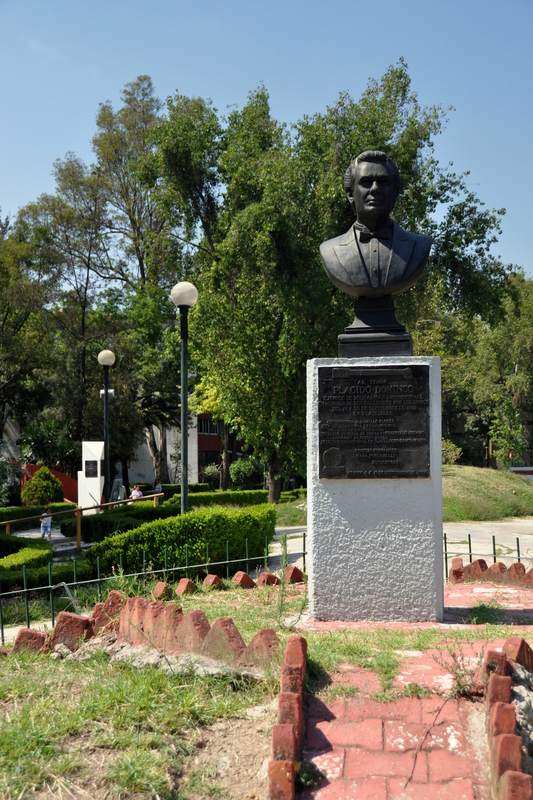 A bust in his honor stands forgotten in a parking lot island between Paseo de la Reforma and Conjunto Urbano Nonoalco Tlatelolco. Incidentally, Conjunto Urbano Nonoalco Tlatelolco (which I dare not abbreviate) is the largest apartment complex in Latin America. At the time of the earthquake, the mass of apartments was said to have accounted for 30% of the city’s public housing. I was astonished upon learning of the sheer number of museums and other points of interest for hearty explorers to Tlatelolco. The barrio’s Plaza de las Tres Culturas (Square of the Three Cultures), with its pre-Hispanic, colonial, and contemporary architectural elements, serves as the main touristic drawcard for the area, but in fact it is just one of several sites worth visiting. Plaza de las Tres Culturas is a football field-sized plaza that plays host to a large Aztec site that is still under excavation. Entrance is free, and visitors can explore the ruins via a platform with informative placards along the way. A pair of his-and-her skeletons dating back to 1473 was among dozens unearthed during recent excavations and is something to look for. Also on the grounds, making a nice backdrop to the ruins, is the Spanish-era parish church I mentioned earlier, the colonial-style Church of Santiago. This simple church has erratic opening hours but is sparsely-illuminated inside. When I stepped inside for the first time in 2003, a crucifix hung suspended from the ceiling a few feet in front of the altar, and the effect was humbling. Today the crucifix is mounted on the back wall – “earthquake-safe,” I’d surmise, but less evocative as a result. It is said that Juan Diego, the indigenous monk who achieved sainthood in 2002, almost 500 years after seeing an apparition of the Virgin Mary, was baptized here. The third “culture” to be found dates back to the 1970’s: the former Secretary of Exterior Relations Building, towering to the south of the ruins. This enormous building towers over everything in the vicinity and serves two functions today: 1) it houses offices for the aforementioned UNAM, and 2) it plays host to the Centro Cultural Tlatelolco, which in turn features several small museums. The building’s exterior is illuminated at nightfall in red neon, and can be seen from miles away. 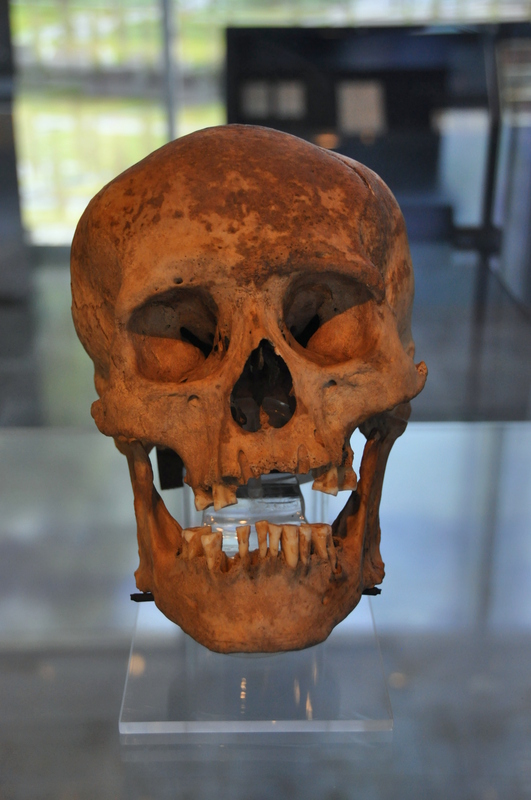 I counted four museums in the vicinity, in addition to the Tlatelolco ruins and site museum. The aforementioned Centro Cultural Tlatelolco (CCU) houses El Memorial del 68, tracing the civil rights advocacy leading directly up to – and after – the Tlatelolco massacre. Upstairs, the Stavenhagen Collection exhibits an impressive array of pre-Colombian artifacts from all over Mexico. Across the courtyard, the Museo Expuesto (literally, “Exposed Museum”) features a small, rotating display of modern art, often political in origin. A single admission ticket grants entry to all of the above museums. As with other Mexico City tourist attractions, entry is free on Sundays. Not included in the CCU ticket but arguably more interesting than the galleries mentioned above is the easy-to-miss Museo Indígena (Indian Museum). It can be found a few blocks away in a colonial building that housed government offices during Spanish rule. 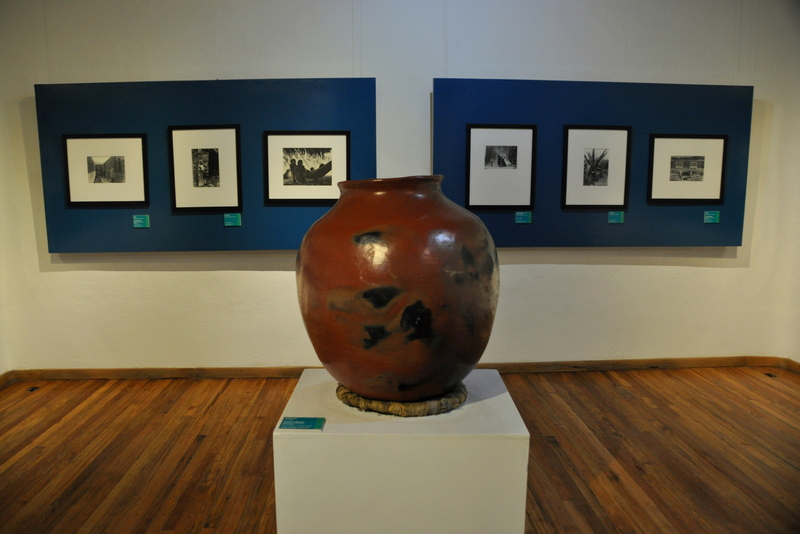 I went there one Saturday expecting to find another museum of pre-Hispanic crafts, but was surprised to find several galleries of contemporary photography and pottery, all featuring or made by surviving indigenous Mexican tribes of today. 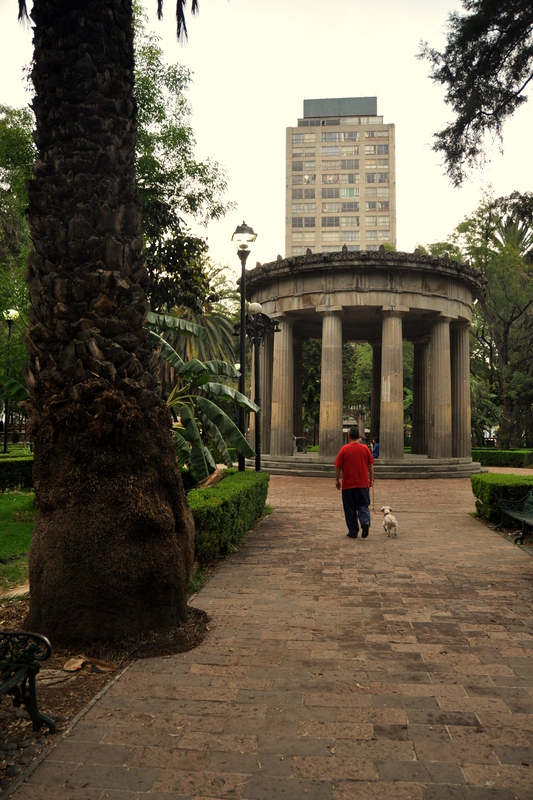 Finally, one of my favorite Mexico City parks can be found in Tlatelolco. Jardin de Santiago (Santiago Garden) is a rectangular garden entirely within a concrete wall. Graceful arched entryways on all sides lead towards a columnar central kiosk. Park benches line the stone paths, and joggers are a common site along the park’s periphery. Santiago Garden is small, but is a perfect place to relax following an afternoon of museum overload from the galleries mentioned above. Do not visit at night. Everything is closed anyway, and after dark, the illuminated Secretary of Exterior Relations Building looks better from afar than from up close. Walk with confidence. 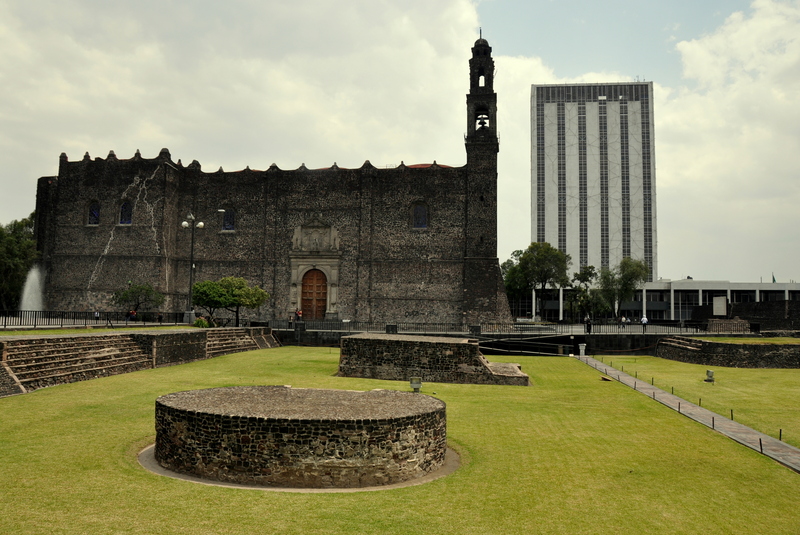 Metro Tlatelolco is a 15-minute walk from the Plaza de las Tres Culturas. The station is not one of the prettier ones in the system, although that’s more a factor of the neighborhood’s 1960’s architecture than anything else. 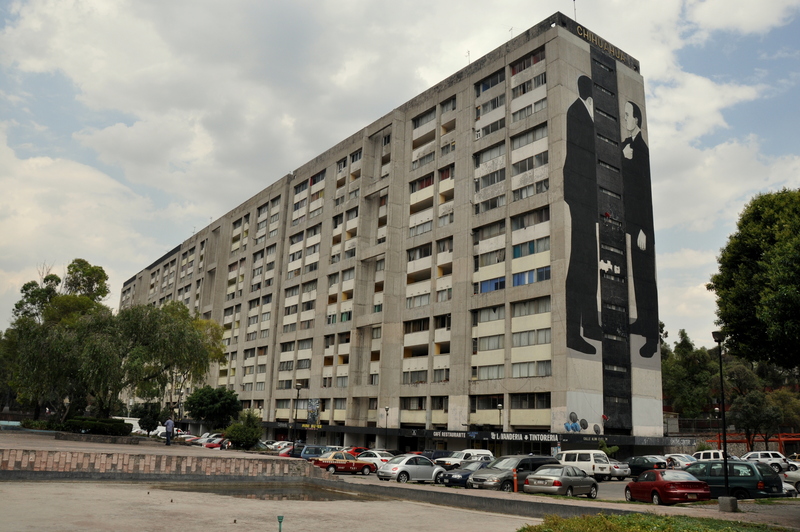 The most direct route to the plaza is through Conjunto Urbano Nonoalco Tlatelolco. I actually like this complex. Each building houses its own laundry facilities, tiendita (small shop), and restaurant. The grounds features numerous basketball courts, park benches, and small green spaces, and they comes alive most afternoons as mothers play with their children and elderly residents walk their small dogs. Additionally, an orange pavilion of sorts runs throughout much of the complex, providing shelter from the frequent summer rains. It doubles as a slice of colorful period sculpture art. Take as many photos as you want at the plaza and inside the museums, and of the buildings from afar. Many of them feature interesting murals. Be sure to ask permission whenever photographing locals, although this is as much an issue of manners as it is of safety. Note that the Chihuahua Building, due east of the ruins and the church (you can’t miss it) is said to be more crime-ridden than the average building in the complex. It seems safe enough, but it would be irresponsible of me not to mention this statistic. I mentioned earlier in this post about the centuries-old animosity between Tlatelolco and Tepito. In May of 2013, 12 Tepito youths – alleged members and associates of that barrio’s Tepis gang – were kidnapped and murdered by what authorities believe to be a rival gang, La Unión de Insurgentes. 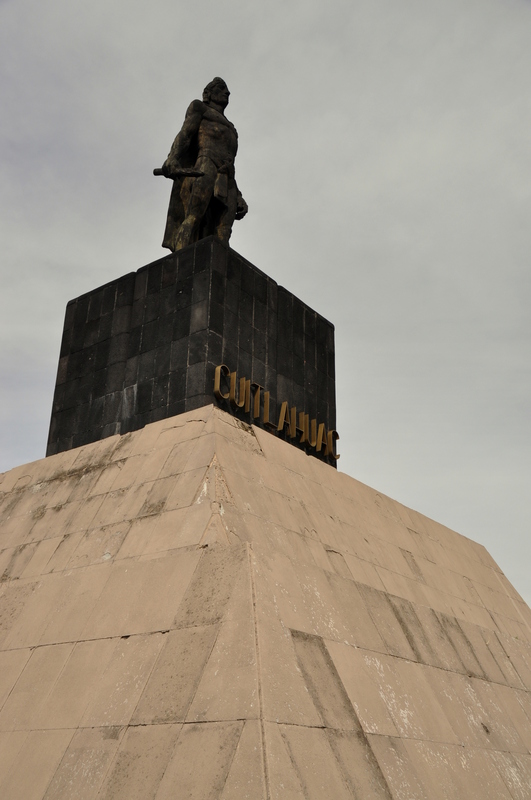 La Unión is said to call the entirety of Insurgentes Avenue its turf. Insurgentes, in turn, passes directly through Tlatelolco. There surely is a connection. At the time of writing, however, the case remains unsolved. Here is a BBC article from June of that year about the kidnappings. The article was published not long after the kidnappings were reported, and before the bodies of the victims were recovered – in a mass grave outside the capital. 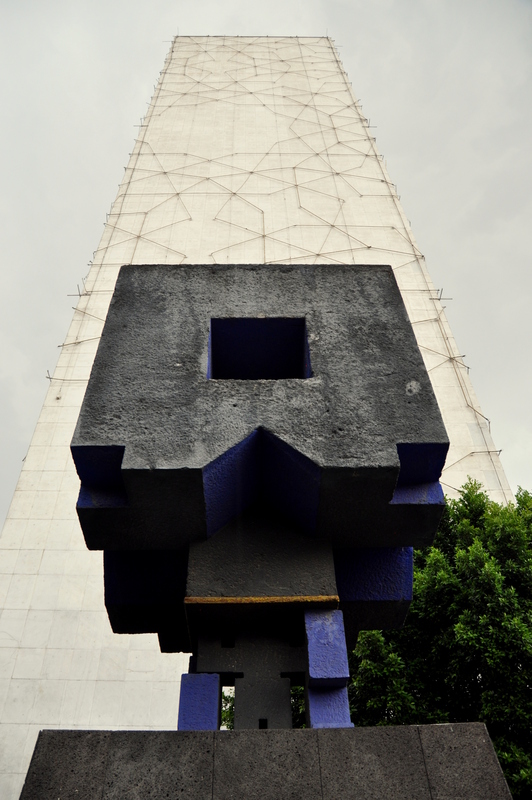 I have visited Tlatelolco several times, and always without incident. I believe that the neighborhood’s violence is almost always drug- or gang-related, and that it never intentionally targets tourists. I go there with a bit more diligence than I do when visiting other neighborhoods, but I go nonetheless. Tlatelolco is tough, a barrio bravo to be certain. A barrio vibrante, too. Great post! Very comprehensive – I´vé been to all of the places you mention and have always felt safe and had no problems. Nearby colonia guerrero has some sketchy parts..maybe next in your series of barrios bravos? Thanks man! Good suggestion…what are the boundaries of Colonia Guerrero, roughly speaking? I’m asking b/c I’m not sure if I’ve actually been there or not. A while back I revisited the Plaza of the Three Cultures. The neighborhood is more scruffy than I remembered it, but I did not feel unsafe. I went to the Memorial del 68 Museum and found it very moving. Coincidentally, on that same trip I saw a movie which had just been released called “Summer of 68”. It’s a tragic love story between a rich student and a poor student set against the events of 1968. It doesn’t flinch at portraying President Gustavo Díaz Ordaz as the creep that he was. I haven’t seen that movie, but “scruffy” is a good way to describe Tlatelolco. I wonder about the sense of community that must be fostered by living in those apartment towers.